You think about a lot of things when you’re about to move to a new country. Will I like it there? Will I make friends? Will my apartment actually look like the pictures? Am I making a big mistake? Yes, you think about all these things, but what you don’t think about- where will I pee? Coming from the States, one thing I never gave a second thought to is “where will the next bathroom be?” Without fail there is a restroom in every store, every restaurant, every mall and, though usually not ideal, every rest stop along the way from point A to point B. Living in Paris changes all of that. The French have mastered the art of being parched and I bet in no small way related to the fact that public toilettes (real ones) are so difficult to find. I remember reading a David Lebovitz article a while back that mentioned a trip to Disneyland Paris with a French friend who didn’t use the restroom for the entire day. In case you missed that last part, let me reiterate: the entire day. Clearly Napoleon had his hand in some evolutionary type magic, that gifted the French with the world’s largest bladders, but I digress. Before I arrived I may or may not have been addicted to l’eau. If I went more than half an hour without water something was very, very wrong. So, when I came to France, it was a little distressing to find that a picnic at the Place des Vosges, for me at least, involved everything but the very elixir of life. Who knew when I’d make it back home and I certainly wasn’t going to use the public space toilets (my words, not theirs) that can be found throughout the streets of Paris. Side note here: I say that with all the love I can muster. The idea is great, really. But I’ve seen the insides of those things and self cleaning they are not. No, no, no. Public toilets can also be found inside large metro and train stations like Chatelet and Gare de l’Est, but unless you’re either 1. Bubble Boy or 2. Bathed in sanitizer with the ability to levitate, I’d advise against it. Over time I’ve tried to channel my inner camel and hydrate less. I know now that I can order un cafe from any sidewalk bistrot and in exchange they will allow me to use their hole in the ground- so gracious, thank you. Another fun game I’ve taken to playing is trying to remember where all of the free public bathrooms are located across the city, you know, kind of like that app for NYC, only it’s in my head. The tricky thing is figuring out which ones are gratuit versus which ones will cost you. The ones by Notre Dame? Free. The ones in Jardin du Luxembourg? Money. Traveling from across the pond it’s hard to come to terms with paying to use the loo, but judging from the large number of people using any outdoor surface as their own personal toilette here, that sentiment might transcend borders. Notre Dame/Saint Chapel/Ile St. Louis: Free. Facing the cathedral from the courtyard, restrooms are on your right, toward the Seine. There are also restrooms behind Notre Dame, in Square John XXIII. Louvre: Free. You will need to line up to gain access into the Carousel du Louvre/ticket hall, but please (please!) do yourself a favor and go in through the entrance by the Tuileries instead- much shorter queues. Hotel de Ville: Free. Head into the BHV department store across from Hotel de Ville and take the escalator up to floor 5. Champs Elysee/Arc de Triomphe: Free/Paid depending on your preference. Any Starbucks or McDonald’s has a bathroom that requires a code for access to the door. This code can be found on the bottom of your receipt, thereby “forcing” you to order before using the facilities. Usually if you simply stand outside the door, someone will come out or go in and then you’re golden. More often than not, the lines are so long that the door remains open and you can just pop in the queue. Boulevard Haussman/Opera Garnier: Free. Large department stores such as Galerie Lafayette or Printemps will have restrooms on the first floor. Zara lovers are out of luck- smaller retailers will not allow you to use their facilities. Eiffel Tower: Free. Facing la Tour Eiffel with the Trocadero at your back, restrooms are on the left hand side of the Tower near the feet. Jardin du Luxembourg: Free/Paid. There are a few in the park, but the two you will most likely use are behind the snack bar near the central pond and near the grassy area by Avenue l’Observitoire. If you’re less inclined to spend your precious centimes, head right outside the gates to the McDonald’s or Quick Burger. Pompidou Center: Free. As with the Louvre, you will need to go through the line to enter the main hall. Latin Quarter: Free. For this area I’d recommend either the restrooms by Notre Dame or the Starbucks/McDonald’s by the Odeon metro station. No public facilities exist in this area so unless you’re going to grab a kebab from Maison de Gyro (highly recommended by the way), that’s the way to go. Jardin des Tuileries: Paid. 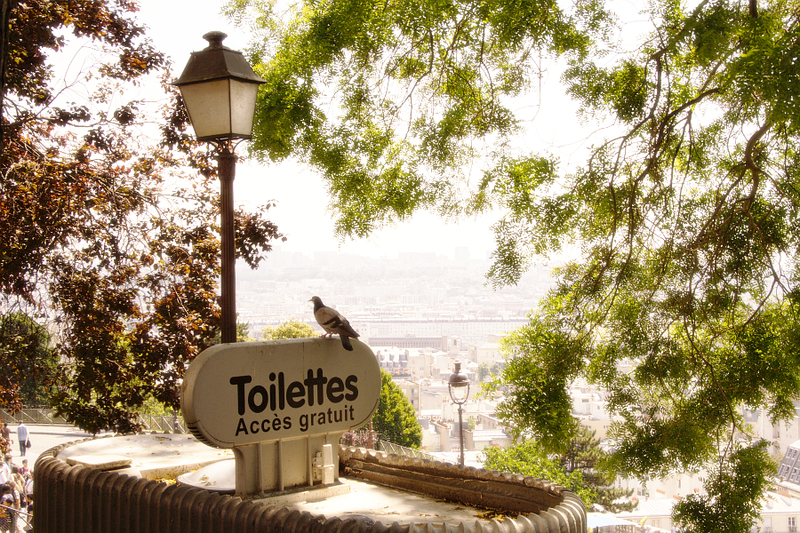 Restrooms are located at the entrance to the gardens, closest to Place de la Concorde. Sacre Coeur: Paid (tip only)/Free. Facing the cathedral, the restrooms will be on your bottom right. If you’d rather visit a Starbucks (they truly are everywhere), there is one on Rue Norvins off of Place du Tertre. Place des Vosges/Marais: Free/Paid. Head to Musee Carnavalet. Entrance to the permanent collections is free and so are their restrooms. If you’re short on time or can’t make it to the museum, it’s a great excuse to visit one of the charming cafes that line the square and use the facilities while there. Pont Alexandre/Petit Palais: Free. Entrance to the Petit Palais is always free of charge (and worth a stop regardless), and as a bonus offers restrooms to visitors. Musee d’Orsay/Pont des Arts: Free. Head down the steps to les Berges, the Seine-side regeneration project that offers, among countless other things, restrooms along the entire length of this public space. Parc de la Villette: Free. Depending on where you find yourself, there are public restrooms at the Grande Hall de la Villette as well as in the Cite des Sciences et de l’Industrie, the largest science museum in Europe. Parc Monceau: Free. Restrooms are located at the entrance to the park on Boulevard de Courcelles. Canal St. Martin: Free/Paid. Your best bet in this area is visiting one of the McDonald’s or Quick Burgers along the canal for a free restroom or stopping by one of the great cafes that are invariably crowded all day and night. Lastly, if you’re feeling brave, a list of the more than 400 sanisettes (space toilets) around Paris can be found here. Consequently, there’s also an app for that here.